Does Spider-Man Start Marvel’s Zombie Apocalypse? Marvel’s Clone-based storytelling has been a controversial element within their Spider-Man Universe (aka the “Spider-Verse”), something which long-time Spidey-writer Dan Slott is well-aware of. Fans of Spider-Man have been touch about clones ever since the oft-maligned Clone Saga stretched on far-too-long back in the 90s. This time around, though, Slott and his creative team are taking clones to a different place, one which could have ramifications for the entire Marvel Multiverse. First, a little backstory, though: The Jackal has covertly running New U corporation, which is capable of making medical miracles happen. Peter Parker's first exposure came after they brought one of Parker Industries' employees back from the brink of death after a lab explosion. However, when he visited his colleague, the man set off Peter's spider-senses like firecrackers on the fourth of July. As Miles Warren later reveals, his clones are actually reanimated tissue pulled from dead cells – with in-tact memories of their former lives. In the first issue of The Clone Conspiracy, Spidey tackled (or was tackled by) his longtime adversary, Doctor Otto Octavius. It turns out Doc Ock survived his trip to the future as Superior Spider-Man by transferring his consciousness into a robot during the Spider-Verse epic and catching a ride back to his own time. As if a showdown with Octavius wasn't enough, Spidey was also confronted by yet another clone of Gwen Stacy (after all, Dr. Warren seems rather fond of duplicating her). The curious thing is, unlike all of Warren's other dupes, she doesn't set-off his spider-senses. The next curiosity is the Jackal himself. Instead of setting a web to catch a fly (er, Spider), he seems to have been expecting Spider-Man and has apparently benign intentions towards him (for the moment, anyway). Prowler #1 already set up a reanimated Hobie Brown as the watchdog over Jackal's army of supervillains, the one trying to keep them on their best behavior for the most part. In fact, it seems Spidey's rogues make up Warren's “reformed” security team, although needing a team of supervillains is still pretty weird for a reformed man. Nonetheless, the Jackal does call off Doc Ock's attack and even apologizes for Rhino and Electro’s heavy-handed tactics. He then offers a perplexed Peter Parker a tour of his facilities, giving him the rundown on his reanimation process along the way. The tour ends with in the very room where his docile (thanks to their dependence upon his anti-degeneration pills) former menaces reside. It's here that Warren claims he's “granted” Spider-Man's greatest wish – that “no one dies” on his watch, something Spider-Man vowed after J. Jonah Jameson's wife was killed in The Amazing Spider-Man #655. How The Jackal knows Parker's vow is certainly unnerving to say the least. Sure, he could follow Spidey on Twitter, but it doesn't seem likely. What happens next, though, takes everyone by surprise. Spider-Man isn’t taking his tight surroundings or his companions particularly well. A roomful of nefarious nemeses has a way making anyone including the wall-crawler very nervous. But when the Jackal introduces several reanimated friends and colleagues, including Captain Stacy, Dr. Kafka, Jean DeWolff, as well as his recently among-the-living cohort the Prowler, his anger turns to confusion and outright rage. Although his first instinct is to fight the assembled group, the Jackal isn't hearing anything of it. His purpose for recreating all the allies and enemies of Spider-Man (those who’ve died under his watch) is to soften Peter Parker up. However, his sales pitch is cut short when Captain Stacy shoves a gun in his daughter’s face, claiming that she’s not his “real daughter.” In one swift movement, Gwen dodges her 'father’s' bullet, literally and figuratively, admitting that she isn’t a clone of Gwen Stacy but an alternate universe Gwen (a.k.a Spider-Woman or Spider-Gwen from Marvel Earth-65). She and Spider-Man flee the building with the assembled reanimated security force in hot pursuit. As they make their getaway, she radios her partner for help, noting that her cover at New U has been blown. As they communicate, Peter overhears her comrade's name, none other than Spidey's clone and reformed enemy, Kaine (last seen ‘dying’ during the Spider-Verse epic). Earlier in the story, Kaine was shown waking from a horrifying nightmare where a zombie horde threatened to consume and infect him. It turns out he hasn't just been watching too much The Walking Dead. He and Spider-Gwen have made several forays into alternate universes. In each realm, undead legions have been tearing up the place, all thanks to the Jackal's latest scheme. As Spider-Man and -Gwen make haste out of the New U compound, Kaine flies across town in a “borrowed” vehicle to Horizon University, in search of meds for his patient zero. There, he visits Peter Parker’s colleagues, who are attempting to replicate the Jackal's anti-degeneration pills. His passenger turns out to be the actual Gwen-clone in need of a capsule to keep her from going all flesh-eater on them. As the disturbed staffers lead the clone away, Anna Maria Marconi poses a very valid question to the spider-clone: Why keep Spider-Man out of the loop? What he tells her will set The Clone Conspiracy apart from its duplicating predecessors entirely. Kaine tells Ms. Marconi that he didn't inform Spider-Man due to his experience in "dozens" universes where Parker Industries and New U are in bed together. Holding up a flyer for emphasis, it seems Parker Industries has merged with New U, somehow kick-starting an undead plague. Apparently, The Clone Conspiracy has more in common with Marvel Zombies than its loose namesake (could the MU face another zombie outbreak which even links up with Monsters Unleashed?). The first two issues have already proved somewhat different than an everyday average Clone Saga-inspired story. While the reanimated tissue versus clone angle is novel compared to previous Spider-Verse epics, the inclusion of a multiverse task force and pesky living dead ought to prove quite intriguing in the long run. The Jackal’s low-key attitude and attempt to woo Peter Parker, as well as his army of pliable supervillains makes him a more dangerous and unpredictable threat than ever before. His seemingly good intentions (paving that good ole path to hell) also add a layer of depth to his normally one-note character. Even though the second issue runs a little on the slow side, it has a lot of plot to unspool, which is understandable. Slott's inclusion of classic and modern Spider-clones and alternative universe characters may have a slightly lived-in feeling, but at the same time, it's great to see Kaine and Spider-Gwen get some more face time alongside Spidey – especially with Jim Cheung's dynamic panels and John Dell's sharp line work. 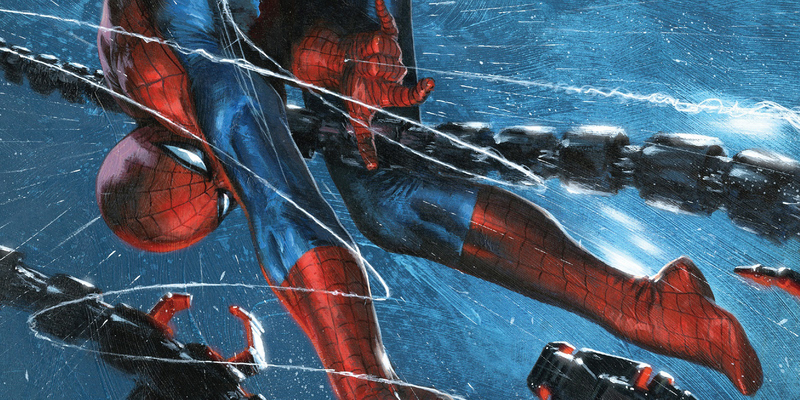 In all hopes, Clone Conspiracy #3, as well as Amazing Spider-Man #21, will offer greater insight into these disturbing developments as they unfold. Dead No More could finally be the event which removes some of that bad Spider-clone taste from our mouths.